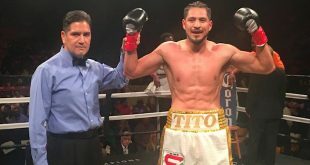 On Saturday night, the big focus was on the CenturyLink Center in America's Omaha, Nebraska where over 11,000 fans witnessed the lightweight swan song of WBO champion Terence Crawford. Crawford, 25-0 (17), put on a clinic as the fast-handed local man handled the pressure of Mexican left-hook artist Raymundo Beltran, 29-7-1 (17), with great skill. Behind superb footwork and southpaw and orthodox stances, Crawford punished Beltran with an ever-present jab that kept the challenger at bay and disrupted any offensive plan the former Manny Pacquiao sparring partner hoped to employ. Beltran's successful sequences were few and far between as Crawford was just too fast and focused. By the later rounds, Beltran's face showed signs of the punishment handed out by the champion. 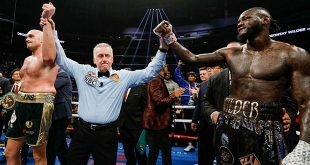 Crawford won a well-deserved 120-108, 119-109, 119-109 decision and will now reportedly move up to the light welterweight division and contend for the vacant WBO belt, possibly against number one contender Lucas Matthysse. On the undercard, IBF featherweight king Evgeny Gradovich, 19-0-1 (9), tangled with challenger Jayson Velez, 22-0-1 (16), in a competitive 12 round clash. Velez took the first four rounds behind and energetic jab and good movement but thereafter Gradovich closed the distance and outboxed the lanky Puerto Rican. When the cards were read, Velez surprisingly was awarded one, 115-113, while Gradovich took the second by a too-wide 117-113 while the third was even at 114-114, producing a split draw, allowing Gradovich to keep his title. Every female welterweight belt of note was on the line at Falconer Centeret in Frederiksberg, Denmark as world champion Cecilia Braekhus, 27-0 (7), posted a 100-90, 100-90, 98-92 points verdict over ex-IBF light middle strapholder Jennifer Retzke, 15-2-1 (9). It was the 17th consecutive world title victory for Braekhus, who stands far atop the welterweight division. Heading over to London, England, the British and European heavyweight titles were fought over by domestic rivals Tyson Fury, 23-0 (17), and Dereck Chisora, 20-5 (13), at the ExCel Arena. The pair first tangled in 2011, with Fury winning a decision handily, and this time the towering Manchester area man was even more dominant, turning southpaw to control Chisora with a damaging jab. After 10 one-sided rounds, Chisora's corner decided that he had taken enough punishment and called off the contest. Fury is now the mandatory challenger for Wladimir Klitschko's WBO title, which, if the bout comes off, will place Klitschko in the unusual position of fighting a taller man. 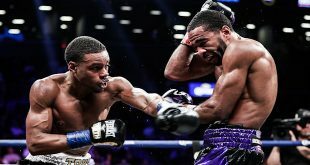 There were also three interesting clashes on the bill as middleweight Billy Joe Saunders, 21-0 (11), outboxed Chris Eubank Jr, 18-1 (13), to retain the British, Commonwealth and European titles. Welterweight Frankie Gavin, 21-1 (13), retained his British belt and added the Commonwealth crown win a points win over Bradley Skeete, 18-1 (7), and super featherweight Liam Walsh, 17-0 (11), outpointed Gary Sykes, 27-4 (6), also for the British and Commonwealth titles. Previous Deja Vu? Can Eubank Jr Bring Back Father’s Magic Tonight?